My wife and I recently had a discussion about two movies we own and how I like to watch them over and over again. The two movies are Dan in Real Life and WALL•E. What I find appealing about these two films in particular is the awkward way in which the protagonist in each engages his love interest. In Dan in Real Life, Steve Carell is a widower with three girls, who meets a woman and hits it off with her while on a weekend in Rhode Island only to discover she is his brother’s new girlfriend- a fact he would have learned if he didn’t do all the talking. Throughout the movie, Carell shines, in all his comic glory, as his character deals with the complicated situation, fighting off (to no avail) falling in love with a woman who is in a relationship. In WALL•E, the protagonist is a robot, whose name is an acronym (“Waste Allocation Load Lifter- Earth Class”). He appears to be the last moving thing on a waste-covered Earth- other than a cockroach. When a spaceship lands and deploys EVE (“Extraterrestrial Vegetation Evaluator”), a female robot and love interest to WALL•E, he becomes smitten. The montage sequence when he tries to get close to and woo her is classic. My whole point in blogging about this is I was an awkward mess when I first became “smitten” with my wife. I was twenty years old and she was nineteen when we met; I had zero skills except being my strange self. Bumbling and stumbling, that was my game. I have to admit, there are those gents who seem to be suave and los capitanes de amor, but they still are awkward in their own right. As far as courtship goes, I think God made men to be generally awkward at first in order to humble the proud and give game to the humble. The guy who can laugh at his own eccentricities can work with his opposite-of-suaveness. The fellow who thinks he’s a balling vaquero will sooner or later become the former… or die lonely and macho. The 1991 Spielberg movie, Hook, with Robin Williams and Dustin Hoffman, probably is one of the first movies I can remember thinking of as a “favorite”. I am discrediting and dating myself in the same sentence when I say that I was five years old and some change when this flick came out. I probably actually first watched it a few years later, but regardless of that irrelevancy, I will admit here and now that I can say Hook is one of those movies that left it’s cultural mark on me. Parenthetically, it is no new thing for people, famous or not, who we have become accustomed to having around, whether in our normal everyday lives or on the silver screen, to shake us out of a stupor when they die. I count myself with the uncountable when I say I was shaken out of my personal attitude of taking one for granted today when I heard the news about Robin Williams’ death. The relevancy of this man’s life is not measured in how funny he was (he was very funny), or how famous he was (he was that, too), but the fact that he existed at all. He mattered. When I first watched Hook, I watched it as a young kid who could pick up on the plot line of a workaholic lawyer, a husband and father of two, who also happened to be the grown up version of the boy Peter Pan. I watched how this man in the movie’s first act couldn’t arrive to his son’s baseball game on time, and how his priorities were swayed more towards being successful in his career than as husband and dad. Also, by the third act, I can remember the triumph over shame in Peter being there for his kids when they needed him the most. Williams’ acting, in my opinion, was perfectly tuned to the attitude many of us, men or women, gear ourselves towards. Be successful, stand out in our profession, gain commendation from our peers, and, naturally, make lots of money. All well and good, but not so much if it’s all at the expense of the reasons why those strivings matter in the first place. As a boy, I can remember my dad working and doing his best to be the best in his field. I salute him for doing so. But I can remember that I didn’t care if he was the best at what he did; I cared about him and the time spent with him. In the movie, I believe, that family element was touched upon via Peter rescuing his kids as well as making his office as Dad more important than his career. As a dad now myself, the impact of that basic lesson hits me again, this time as a father learning the lesson every day. This is what I find ultimately valuable from watching this adaptation of J.M. Barrie’s Peter Pan: Williams’ character struggled with very real everyman obstacles in a fantastical setting. The domestic problems he had in the real, everyday, normal world were made drastically and painfully more urgent in Neverland. In the former, he unwittingly ignored his family in order to succeed (and oddly enough provide for said ignored family). In the latter, his children had been captured by Captain Hook and hauled off to Neverland, and their lives were clearly in peril by outside influence (or walking the plank, or semi-dead crocodile). Williams’ character, like all of us, faced choices. Ultimately, in the face of very clear consequences, he chose to do what was right and place others’ before himself. Any good story has that elemental truth in it, whether or not the protagonist opts for the good or not. As a Robin Williams fan, I can enjoy his finest work. As a fan of the movie, Hook, I will draw from it’s enjoyable and entertaining tale. As a husband and father of four (soon to be five), I will draw all that I can from sources which do not shy away from presenting stark truths. As a Christian, to paraphrase C.H. Spurgeon, I can draw from many sources, but I live in the Bible. To me, Hook is a great film. I was and still am a Peter Pan fan. Also, I find all the early ’90s idiosyncrasies nostalgic as well as humorous. The cell phone with the retractable antenna and Rufio’s hair adds up to limitless laughs. The “Gandhi ate more than this” quote during the food fight scene is probably one of my favorite comedic moments in the film. All in all, culturally, looking back on this movie brings back part of my childhood. Also, I can’t ignore the truths found in its script either. And, yes, I cannot mention this movie without saying this: I, too, will miss Robin Williams. Grace and contentment are two things on my mind lately. The former is something ongoing, something which I experience at a deeper level the more I realize, as it’s name suggests, I don’t deserve it. The latter is something I am learning from the contents of the pockets of my jeans. Depending on the day, the contents of my pockets will vary. From the universal contents such as pennies and dimes and lint, not Lent (that would be an odd as well as an abstract thing to carry around), to more personality-specific items such as a guitar pick or a ratchet end wrench. Every now and again, perhaps, a small paperback in my back pocket. Not to be found, a silver money clip with a rock star supply of cash or a can of FOP (because if I was a pomade user, I would use Dapper Dan). 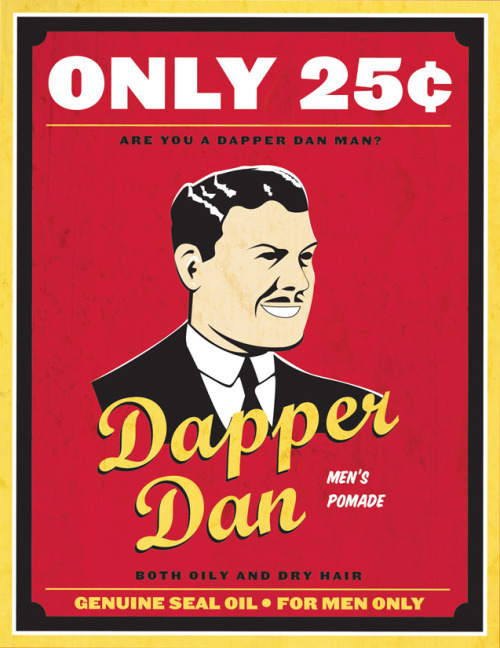 At any rate, monetarily speaking, my pockets are on the lean side of life and to make matters worse, even if I wanted to use Dapper Dan, I probably couldn’t afford it when adjusted to current prices. Therefore, lately, I have been in a less-than-content state of mind. The obvious and thankful fact that I have pants at all is lost to me when I wander from the immutable truth that God doesn’t forsake His elect. That doesn’t mean He won’t let His children go without things like aromatic hair tonics or rock star money clips. I really should just be glad I am not only a creature but a child of the God who fashioned all things. I suppose, too, the oddities I do have in my pockets also should, in a strange way at the end of a long day at work makes sense to me, be reasons to give thanks. Guitar picks enable the picker to cut the finger nails on the picking hand so he or she doesn’t have to have crazy long nails to pick the strings. Pennies and dimes mean at one time there was a dollar bill used to buy groceries and they are simply the remainders. Lint, not Lent, means, um, my awesome wife washed my jeans. I know how to be brought low and I know how to abound. In any and every circumstance, I have learned the secret of facing plenty and hunger, abundance and need. I can do all things through him who strengthens me (Philippians 4:12-13, ESV). Not to be mistaken as meaning he could literally fly like an eagle if he wanted or misapplied as a graceless, Christless prosperity gospel mantra, Paul simply stated he could deal both with having and not having. Simple as that. He could deal with it because of the gospel. He could deal with it because his greatest need was met on the Damascus road, where Christ was the intersection. Mistaken Identity: Valdez is Coming! Once, on my first day of a new job, I was waiting to be picked up by the crew on the way out to our job. I was waiting outside my motel at four in the morning with my hard hat and lunch box, when a three quarter ton Dodge Ram with the company logo on the side pulled up. I could see the puzzled looks on their faces. Then, still not sure if they were relieved or disappointed, they smirked as I began walking up to get in and go. It all worked itself out from there. I enjoy getting junk mail in not-my-first-language. It’s like a free mini language course. You know it’s junk mail, as opposed to something legit, when the words, “¡Todo es gratis!” grace the front of the envelope in a bold, zesty font. “Oh, the one with Burt Lancaster?” I’ll reply. “You know, I really haven’t.” And then we get on to talk about other things.